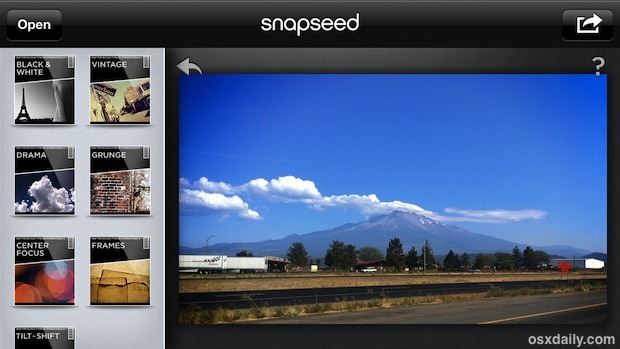 Snapseed is far and away our favorite mobile photo editing app for iOS, and it just got even better because the best image editing app for iPhone, iPad, and iPod touch is now free. No more $4.99 price tag, now everyone can check it out with no obligation other than a quick download. If you’ve never used Snapseed before, the interface can be a little strange at first until you get the hang of it. Practically everything is done by gestures, whether it’s flipping up and down to switch specific adjustments, or swiping left and right to fine tune the strength and level of filters like saturation, brightness, and whatever else you’re tweaking. My advice is to just play around with it a bit, the learning curve isn’t particularly steep and you’ll soon grow to really appreciate how well gestures work for apps like this. Adjustment features include auto correct, precision selective adjust, tuning, straightening, rotating, cropping, and then there are a wide variety of filters too, from black and white, vintage, drama, tilt-shift, and center focus. Each filter and adjustment has a bunch of settings within them, and you’ll quickly discover how powerful Snapseed really is. 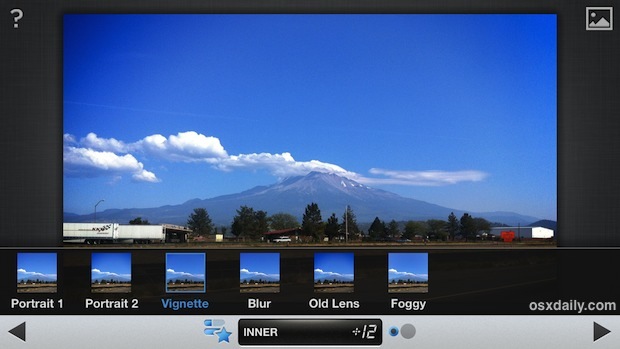 Whether you just want to make your iPhone pictures look better, or if you’re tired of the garish filters of Instagram, Hipstamatic, Camera+, Snapseed is like a breath of fresh air. Sure it has some equally cheesy filters, but if you ignore all that and focus on the basics of photo editing, it’s kind of like a lightweight mobile version of Aperture, and as far as image editing in iOS goes, it doesn’t get any better than this… yet at least. Oh and if Android floats your boat instead, it’s also available free from the Google Play Store, fitting given that the parent company was scooped up by Google earlier in the year. I love SnapSeed, got it for free from Starbucks a while back. As to the interface, it is much better than iPhoto which makes no sense at all! That’s how I got my SnapSeed app. The iPad version is about $15 bucks in the App Store a year later. Best Latte I ever bought. I continue to download a bunch of other photo editing apps like Pixlromatic, PS Express, Instagram and Aviary. iPhoto is OK on my MacBook but not willing to pay for the mobile version after seeing the reviews & great free photo editing apps. So far I feel like SnapSeed & Pixlromatic have been my favorites. Bugger, I bought this a couple of weeks ago, and now it’s free. It’s OK but wasn’t worth the price. I guess they’re going to start charging to buy additional filters, so I’m screwed twice. I’m worried actually, now that it’s free. I hope the quality of the program doesn’t go down, or there are less updates/bug fixes. I haven’t updated yet, unsure if I will. I think this is a top 10 app for sure. I wish there was an ability to Font/Word stamp some pictures.. I normally import into PicFrame to do so. All the reviews I’ve read in iPad Store say they regret updating…so you might consider sticking with your original paid version for a while…. How do you delete a photo in the app? I think Snapseed is a really amazing tool. I have been using it since it was a stand alone app and google hasn’t aquired it. I have also made a detailed post about some of the best photo editing apps available for both iPhone and Android.